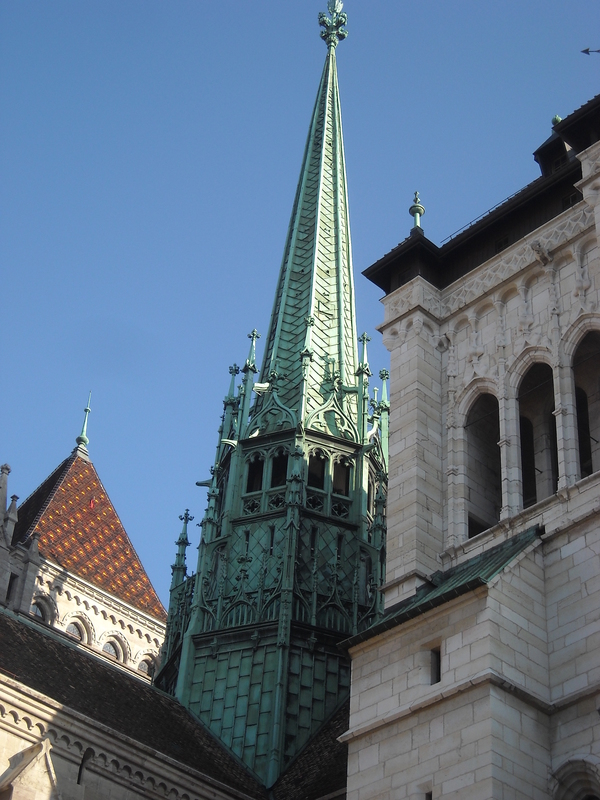 Our last week in Switzerland and still so much to see. 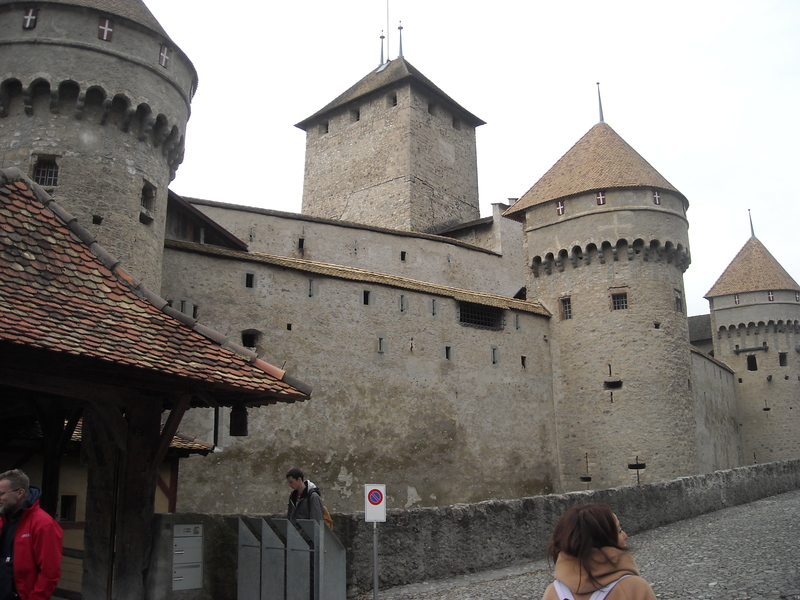 Last week we checked out Montreux and the Chateau Chillon. 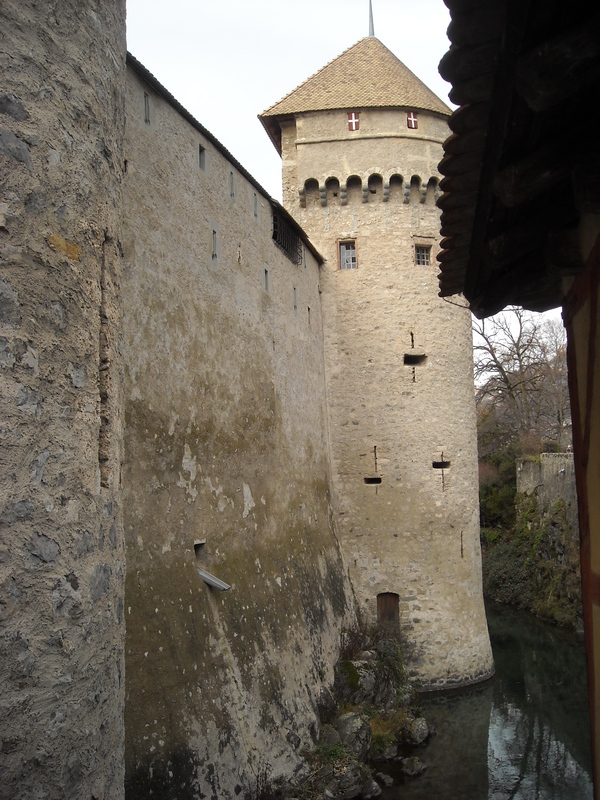 Very interesting stories surrounding these castles/forts…and dating back to the times of Game of Thrones. Difficult to imagine living in these freezing, stone fortresses. They must have had fires burning all over the structure, all year round, to stay warm, even in summer. 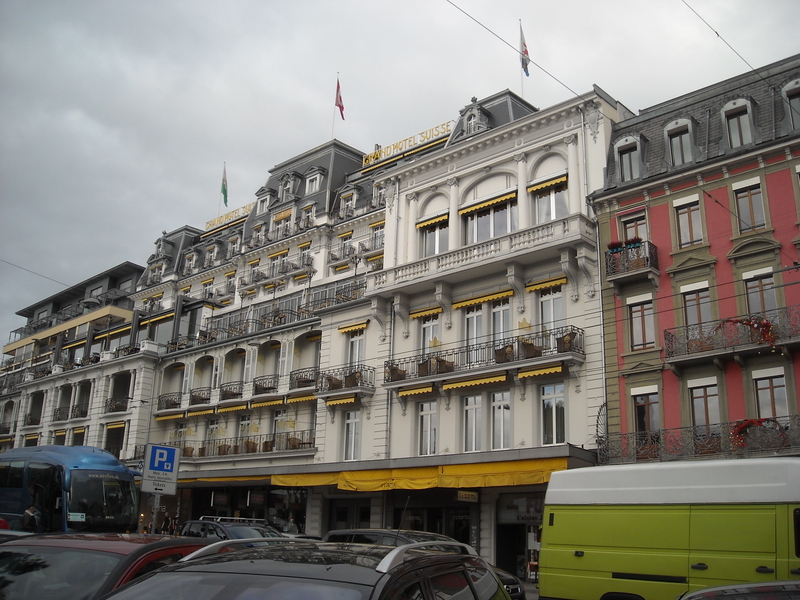 The streets of Montreux are filled with expensvie shopping areas and parks on the lake. We never see skyscrapers…would imagine Zurich is the place to see the larger office buildings. Everything here, and the other cities we’ve visited, are old buildings, each with their own character, and winding, narrow streets, which somehow still allow tiny cars to travel slowly. There are very few stop signs or red lights, instead, the intersections are made up of roundabouts which require driving with care and courtesy. Somehow it works, but I can’t imagine it in major intersections in the states. If a pedestrian steps into a crosswalk, the cars on the road automatically stop to allow them to cross…it’s standard operating procedure and, so far, we’ve seen everybody follow the rules. 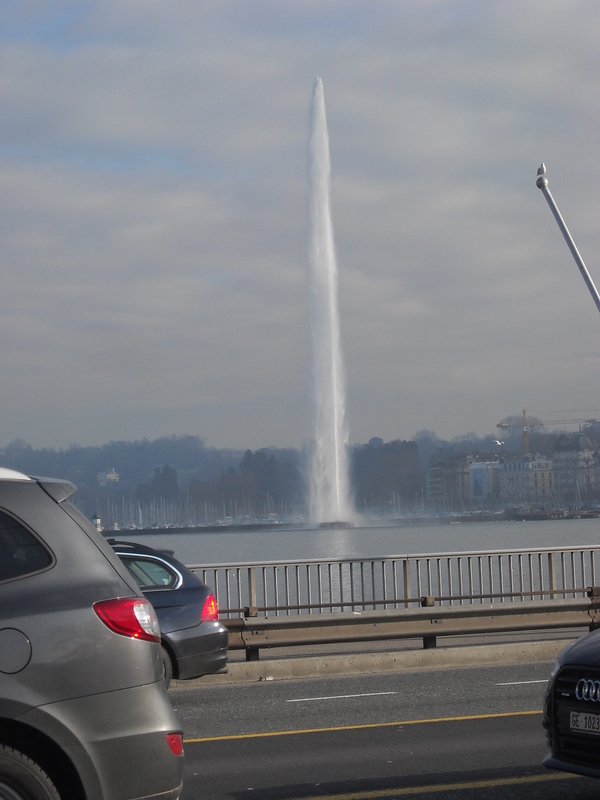 We spent an afternoon shopping in Geneva, a city full of watches. It was my goal not to leave without a Swiss watchpiece and I was finally successful with this trip into town. 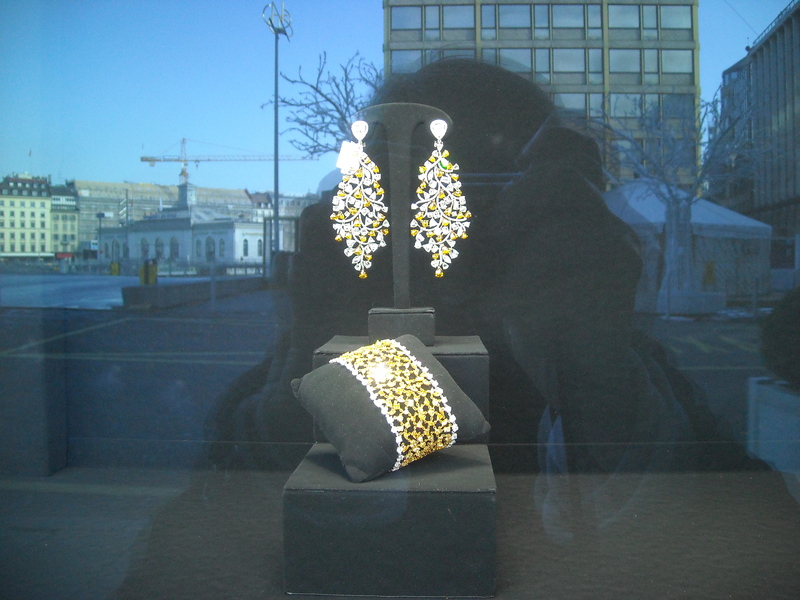 They range in price from around $50 to $50,000. Swatch stores pop up everywhere, along with Swarovski products. I wound up finding a Swiss Military plain, black leather-banded, largish numbers, so I can actually see what time it is, and officially made in Switzerland. It feels good to know the time as we’ve been depending on Charlie’s dopey watch which jumps an hour or loses an hour at random so we can never depend on it…it’s been the joke of the trip, but not so funny when needing to get to the train on time. 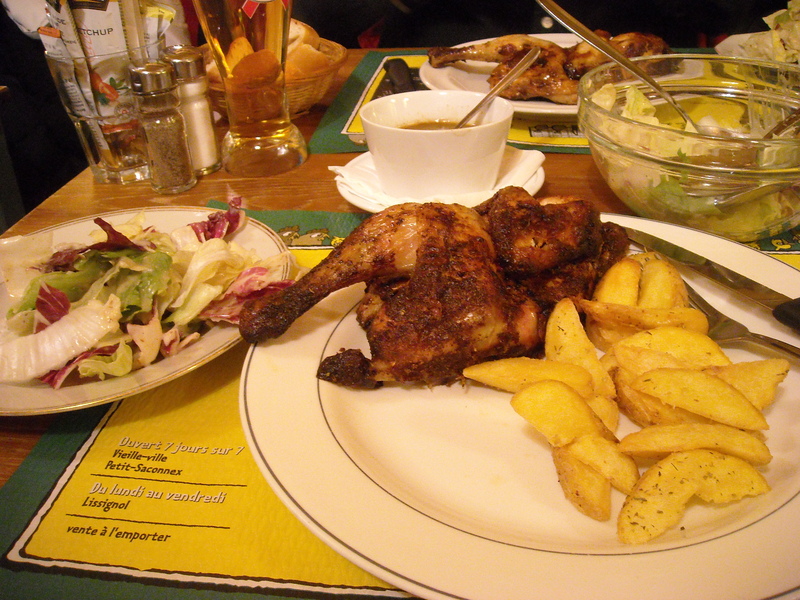 Lunch was enjoyed at Chez Ma Cousine…a cafe that serves chicken, and only chicken (along with salad and the best, most crispy potatoes we’ve had)…your choice of half a roast poulet or chicken salad. 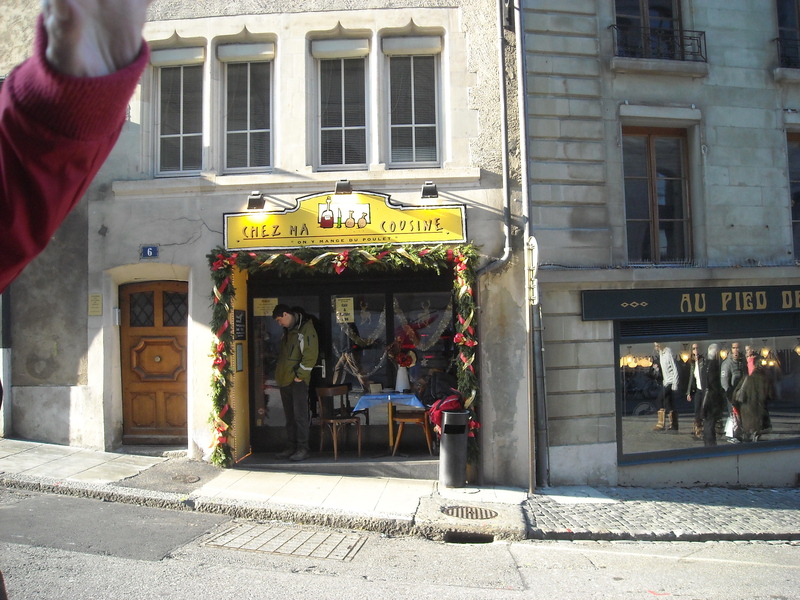 We found it to be one of the most reasonable restaurants in terms of cost and the portions were generous and delicious. We have not eaten out much as the cost is exorbitant with $25 to $35 an entree being the standard, and how about a burger and fries for no less than $20. Pizza is very popular here as it is about the only dish which is affordable. 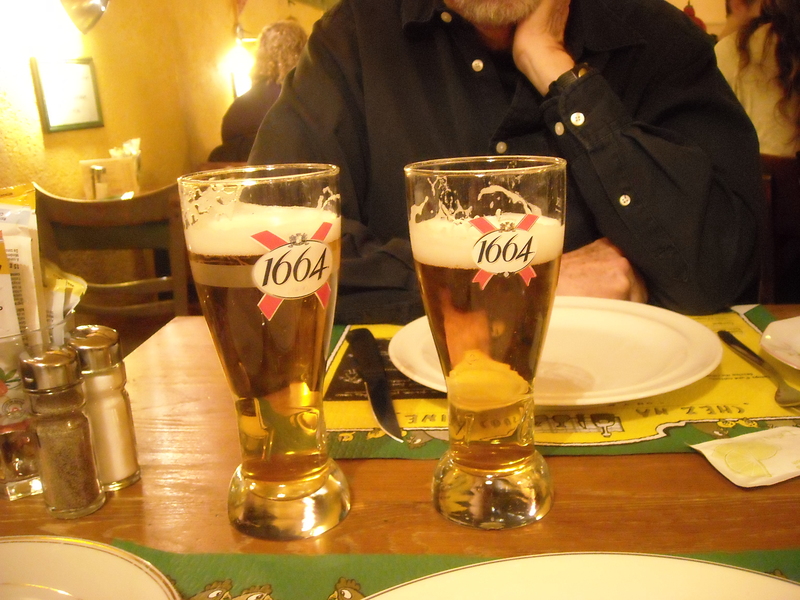 Like Germany, it costs about the same to enjoy a glass of beer or wine as a diet coke or fizzy water, so you know what we chose. The walk to the restaurant was strictly vertical as it sits in a courtyard close to the cathedral which is on the highest point in the city. 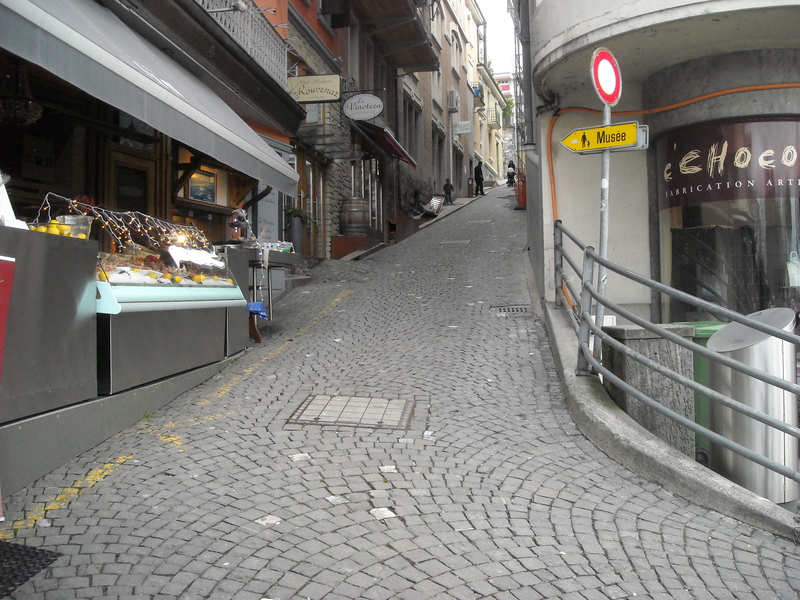 From there the narrow streets go in all sorts of directions, eventually leading back to Lake Geneva. There are department stores which remind me of our Macy’s or Dillards, then there are the stores which are guarded by armed men who look like they could defend their merchandise from an army of jewelry thieves. 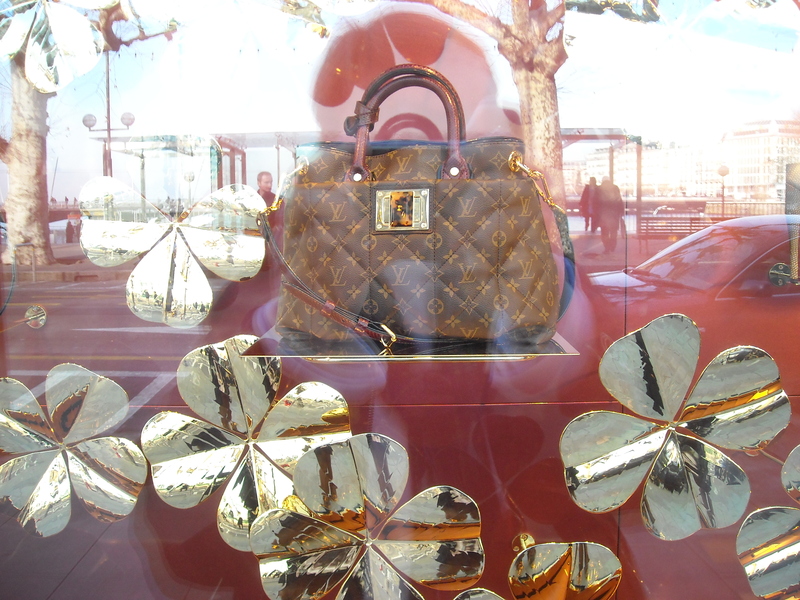 Louis Vuitton has its own building, as does Cartier…the town is dripping in money. 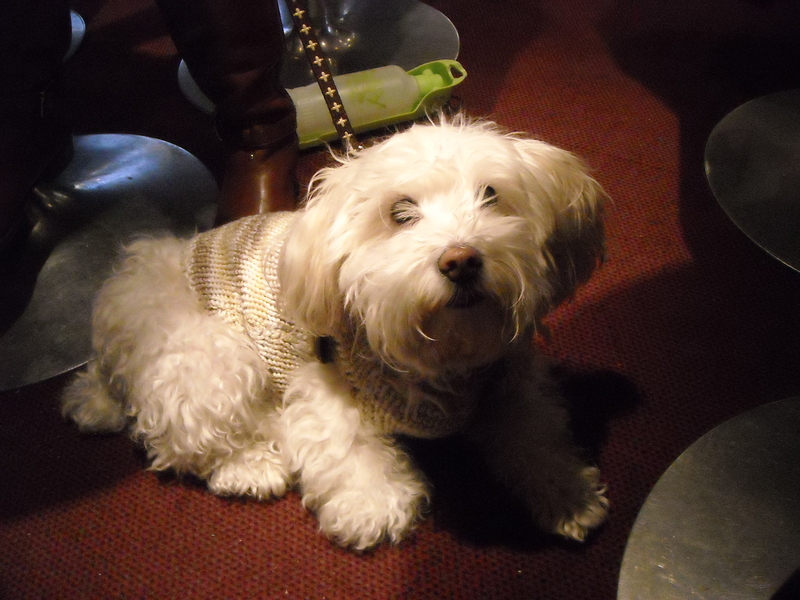 At a small boulangerie, we sat next to a young woman with a cute dog (they are allowed inside restaurants). The ring on her finger almost blinded me at one point when the light hit it just right. This frumpy American felt even more inadequate in the fashion department sitting next to such a fashion plate, and they’re everywhere. Fur is the norm, and it doesn’t look faux, with no PETA protesters in sight. Charlie has a habit of rolling his pants up a bit when putting on his shoes. On this day he forgot to put them back down, which went unnoticed by me, but, stopping in for a coffee, I noticed a man giving Charlie a double take at the cuffs of his pants..maybe he thought it was a new American trend, haha. What’s funny is that when I brought it up to him, he did roll them back down but said that at his age he doesn’t give a damn! C’est la vie! 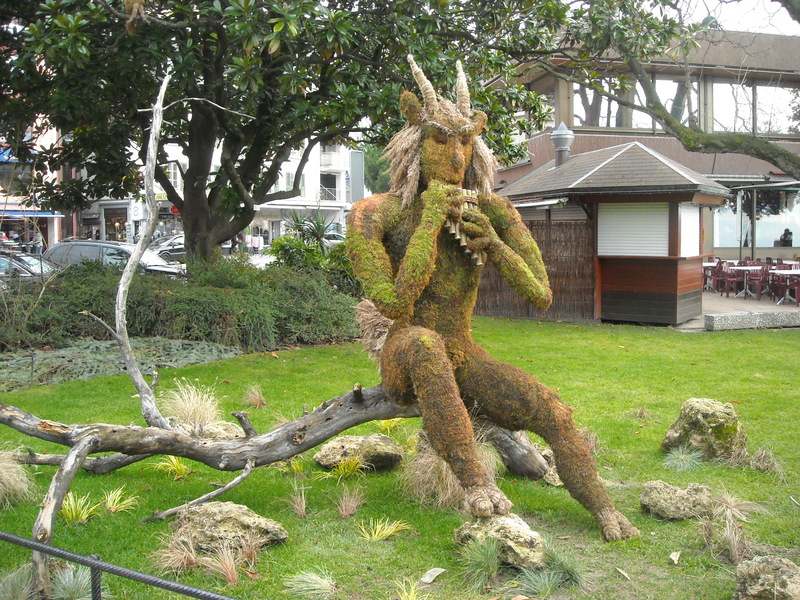 This entry was posted in Uncategorized and tagged Cartier, castle, Chateau, Chillon, Geneva, Montreux, roundabout, Swiss, Switzerland, travel, Vuitton, watch. Bookmark the permalink.